The 26th of April is this year’s Israeli Independence Day. The thoughts expressed here are part of an internal Israeli debate surrounding that day. In March 2011 Israel’s parliament passed a law enabling the Finance Minister to reduce the state’s funding to bodies found to have committed various transgressions, including the following: denial of the existence of the State of Israel as a Jewish and democratic state; an act of contempt or physical desecration that insults the dignity of the national flag or state emblem; or marking Independence Day or the day on which the state was founded as a day of mourning. This budgetary sanction, to which the law applies certain restrictions, is for the time being the limited achievement of Israel’s right-wing parties, which, through their membership of the governing coalition, are seeking to alter Israel’s constitutional foundation and reshape the country’s majority – minority relations. This is a further round in the struggle to establish Israel as “a Jewish and democratic state,” which reveals the insoluble disparity between ethnic and territorial perceptions of citizenship. By means of this and further such laws, so those who initiate them believe, they will be able to reinforce and even to perpetuate the Jewish majority’s current rule over the Arab minority in the country. This legislation, widely known as the “nakba law,” originated in the demand to prohibit Israel’s Palestinian public from marking Independence Day – the State of Israel’s official holiday – as a day of mourning. Independence Day falls on the fifth day of the month of Iyar according to the Hebrew calendar. It marks the ending of the British Mandate in Palestine in 1948, the day on which the Jewish state was declared, and the onset of the battles between the Israeli army and the armies of the Arab countries, and symbolizes to Israel’s Jewish public the beginning of its independence. To Israeli Palestinians, who constitute some 20 percent of the state’s citizens, this date symbolizes their national catastrophe (Ar. : nakba). The legislators have sought to place a sweeping prohibition on this emerging self-awareness, stemming from the Palestinians’ growing national consciousness, which has generated refusal to participate in the state’s ceremonies alongside a series of Palestinian commemoration initiatives. Up to now they have been only partially successful, but their efforts are worrying, since they are part of an overall move to curb Palestinian Israelis’ civil rights. This recent attack on the memory of the nakba may be understood as a reaction to a growing awakening to this event, not merely among the Palestinians themselves, who in any case live with it as a constant family reality that is regularly affirmed within their political, economic and cultural milieu, but also among Israel’s Jewish public. Typically of a majority, by far the greater part of the Jewish public has suffered total amnesia with regard to this history, and in particular toward the sensibilities and feelings of the minority living beside it. A series of events that have occurred since the year 2000 has conveyed Israeli Palestinians’ political distress and frustration to the awareness of the Jewish majority, generating solidarity among a few and a sense of menace among wide circles. I have chosen to address the tension between amnesia and awakening by focusing on a single case, the particular that illuminates the general, in the plural singular form, in a book about the city of Haifa. The city’s municipal tourist and public relations publications suggest that Haifa, Israel’s third largest city, regards itself as “a city of co-existence.” This concept denotes the relative calm, the “good neighborliness” as it is referred to, that prevails between the Jewish majority and the indigenous Palestinian minority, which nowadays constitutes around ten percent of the population. These harmonious relations are manifested in various ways, including the material prosperity enjoyed by a significant portion of the city’s Palestinian population, and the relatively high proportion of those with academic degrees and of people with academic or professional occupations among them. Alongside the concept of coexistence, Haifaites frequently speak of their city as a “mixed city.” One doubts whether this is an appropriate concept. It was coined by the British and served during the Mandate period to indicate cities in which the relative size of the ethnic groups – the Jews and the Arabs – was similar. At this time, of course, power was held not by one of the ethnic groupings but by the British. The “mixed city,” in Mandatory terms, came to an end during the course of a single day and night of fighting between April 21 and April 22, 1948, when Jewish Haifa overcame Arab Haifa. As a result of this defeat the overwhelming majority of Haifa’s Arabs abandoned the city during the ensuing months and became refugees. Of the approximately 70,000 Arabs who had constituted roughly half the population prior to 1948, only a few thousand remained by mid 1948. Arab Jaffa fell to the Jewish forces some days later, and these two occurrences of the collapse and surrender of urban Palestinian centers symbolize the climax of the nakba. Parallel universes thus exist in Haifa: to its Jewish residents Haifa is a city of coexistence, while to its Palestinian residents it symbolizes a stinging defeat, alongside and despite the relative comfort of present day life. I have chosen to reconstruct the process of the disappearance of Arab Haifa’s memory at a thoroughly Israeli “lieu de memoir,” namely Wadi Salib. In Israel’s collective memory this quarter marks the totality of charged relations between Ashkenazis and Mizrahim, or Oriental Jews. The tension between the Jewish establishment, made up largely of people of European origin, and the Jewish immigrants stemming from Arab countries burst forth for the first time in a series of violent incidents in Haifa’s Wadi Salib slum in the summer of 1959. Completely immersed in current issues, people at that time failed to make a connection between the event and the place, and neither did sociological scholarship over subsequent decades. Despite the neighborhood’s Arab name, Wadi Salib, no-one in 1959 and certainly not thereafter paused to recall the former tenants, those indigent Muslims who fled during the fighting of 1948 leaving behind their homes, in which now, in 1959, lived a new set of Jewish paupers. Focusing on this site, the book weaves a dense net of links between the first residents – Muslims of meager means who founded the neighborhood in the last days of the Ottoman period, were left to their own devices under the apathy of British imperial policy and Zionist aspirations toward building the Jewish yishuv, and who fled for their lives in the wake of the 1948 defeat – and the new residents – Jewish refugees from Europe and destitute Moroccan Jews who had migrated to Israel as a result of the process of de-colonization in Morocco following its independence. This is a labor of memory that deciphers the undeniable contradiction of neighbors, within which the victory of one is the day of mourning of the other. Yfaat Weiss is professor in the Department of the History of the Jewish People and head of the Franz Rosenzweig Minerva Research Center for German-Jewish Literature and Cultural History at the Hebrew University of Jerusalem. 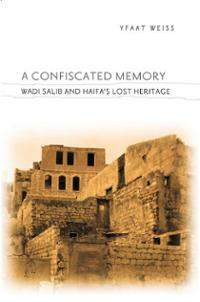 She is the author of A Confiscated Memory: Wadi Salib and Haifa’s Lost Heritage, Columbia University Press 2011.